I received my bag of big wool that I won off eBay yesterday, and it’s not quite the colour I was hoping for. It was called “merry berry”, but it’s really more of a…like a subdued coral colour. Oh well, I’ve started a top-down cardi in it, and if I truly hate the colour I can a) only wear it around the house or b) give it away/ sell it or c) frog it and make a blanket. I bought a new 12mm needle at the store to knit it on – (aside: Kelly and Emma – I forgot to put that little sign on the door when I left and had to go back. har, har) and it’s going SO fast. I’m on my third ball of yarn and have already done the raglan increases and put the sleeve stitches on holders. I used the cast-on method from the Incredible Raglan Sweater generator, and it’s lookin’ good. I’m knitting in garter buttonbands, although it looks like they may want to fold over. After I finish this ball on the body, I’m going to do the sleeves, then continue on the body with the remaining yarn. 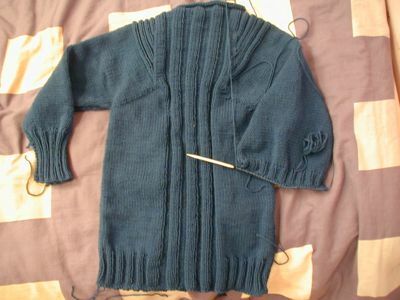 That way, if I run out, it’ll just be a little bit shorter in the body rather than the sleeves. I’m just rambling on and on, aren’t I? 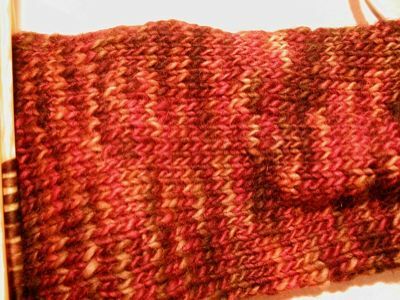 I finished the second manos legwarmer, and I need to get the first one back on the needles to add an extra inch or so. I’ve also started the first sleeve of the Lotech. Syncopated Ribs just before it was completed. The Manos I’m using for the legwarmers. It’s hard to get a good colour pic, though – it’s darker than in this picture. also: I want my Ben Folds book, dammit! I ordered it through the “marketplace” thing on Amazon, and I was really hoping it would get here this week. 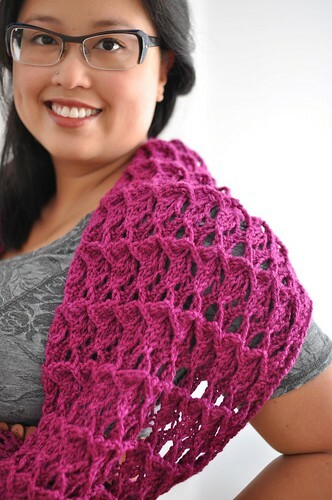 Also there’s the Jo Sharp Silkroad (which I clearly won’t be knitting with for awhile). And the Cotton-Ease, which I’m not expecting for awhile (like a month or two).